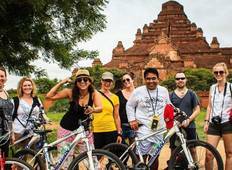 Up to 32% off trips in Myanmar (Burma). 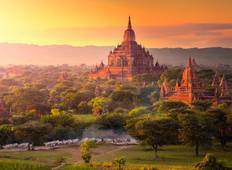 Find more than 54 Myanmar (Burma) tours with major discounts that will save you up to $1,575. "Min is a great guide, encyclopedic in his knowledge, and speaks excellent English!..." "Han Za Oo (Zao Zao) was a brilliant guide, who had not just a big knowledge about..."
"AK was a fantastic tour guide! She was warm and friendly and catered for everyone...."
"Min was just amazing. A kind, selfless and inspirational man who made our experience..."
"Overall the trip was OK. A bit uneven though in that days 2 to 6 were full on visiting..."
"Amazing trip with Bagan as a sublime highlight. The tour guide was excellent and..."
"An amazing trip, Myanmar is a thrilling adventure full of the most generous and warm..."
"The trip was a great way to introduce Myanmar to a senior traveler. The cabins were..."
"I have travelled extensively through Asia: Japan, China, South Korea, Cambodia and..."
"Guide was very knowledgeable. Itinerary was very eventful and packed with sightseeing...."